Your next patient is a previously healthy five-year-old boy accompanied by his grandmother. The grandmother states that the patient has had an itchy rash for the past 15 days. Initially, he had a fever associated with the rash, however the fever only lasted for the first three days and has since resolved. In addition to the fever and rash, the patient has also been complaining of cough, congestion, runny nose, mildly decreased appetite, and headaches. The grandmother states that acetaminophen has been helping with the patient's symptoms and that the patient's mother applying cornstarch with water to the rash to help with the itching. The patient has several siblings at home and one of his brothers had a similar rash however it only lasted for one day. 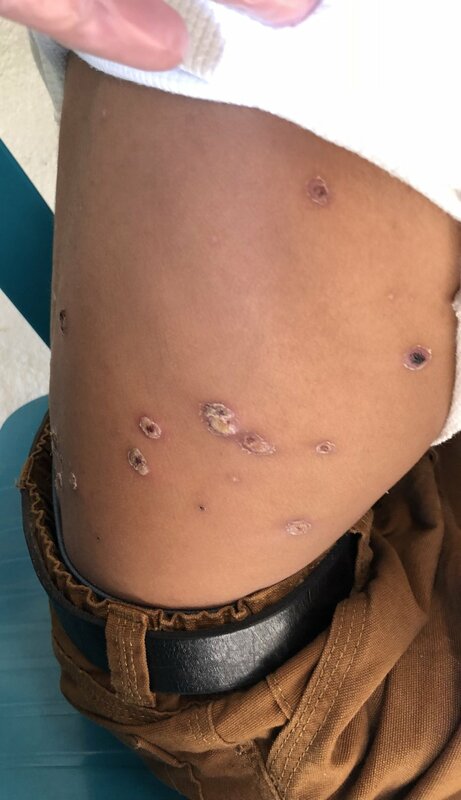 This patient was ultimately diagnosed with chicken pox that had become secondarily infected. He was prescribed cephalexin for seven days as well as chlorpheniramine as an antihistamine for itching. Varicella (commonly known as chickenpox) is a highly contagious, typically mild, self-limiting illness caused by the varicella zoster virus (VZV). It has a very low mortality but fairly significant morbidity, especially in developing countries . Chickenpox was previously extremely common in the United States (US), viewed by many as a childhood rite of passage. In 1990, approximately 4 million people had varicella with the highest incidence occurring in preschool age children . This is reflected in that the majority of cases, approximately 90%, occur in children under the age of 15 years old . Providers who trained in and before the 1990s would hardly have a hard time identifying the characteristic rash. However, since the introduction of varicella vaccine in the US in 1995, the incidence of varicella has declined considerably. In 2012, chicken pox related outpatient visits and hospitalization declined by 84% and 93%, respectively, compared to the pre-vaccination period . Varicella infection is typically heralded by fever, malaise, and headache that precede the characteristic rash. The rash starts on the head and trunk and subsequently spreads to the rest of the body, including mucous membranes. The skin vesicles, typically fluid-filled with a red base, are described as “dew drops on a rose petal”. In a typical evolution of varicella vesicles the clear vesicular fluid becomes cloudy, the vesicle then bursts, and then scabs over. Lesions often appear in patches with one patch scabbing over while another patch crops up. There are lesions in various stages present at any given time . This differentiates chicken pox from other viral rash illness with similar appearances, namely measles and smallpox, which will have only one stage of lesion present . Patient populations that are at increased risk of mortality from varicella infection include those at the extremes of age; immunocompromised patients; pregnant women due to the risk of vertical transmission as either congenital varicella in early pregnancy or later in pregnancy if there is active infection at the time of delivery; and in patients with limited access to health care. Most data regarding the complications of VZV comes from high income countries with temperate climates. Interestingly, there is a poorly understood difference between the epidemiology of VZV in temperate versus tropical climates . Mortality from VZV and its complications are higher in the developing countries. This discrepancy in mortality is maintained even when developing countries are compared to developed countries that do not offer universal varicella vaccination, like the UK [6,7]. However, this is based on limited data, so it is unclear whether the reported case-fatality rates over- or underestimate the mortality burden of VZV. While further research could better assess the disease burden and mortality of varicella in developing countries, the public health value of vaccine is well-established. The World Health Organization (WHO) recommends routine vaccination in countries with established disease surveillance and and in which 80% or greater vaccine coverage can be obtained . In short, providers practicing outside of the few countries that have routine varicella vaccination will continue to see chicken pox and its complications. Management of chicken pox is primarily focused on supportive care with non-aspirin over-the-counter analgesics such as acetaminophen or ibuprofen and ensuring adequate oral intake to prevent dehydration. Topical ointments such as calamine lotion, barrier creams, and colloidal oatmeal baths can alleviate itching and reduce scratching, which can help prevent secondary bacterial infection . It is also imperative to recognize patients at risk for severe varicella infections or severe complications, such as immunocompromised patients. This is particularly important to remember in regions with high HIV/AIDS prevalence. 1. Hussey HS, Abdullahi LH, Collins JE, et al. Varicella zoster virus-associated morbidity and mortality in Africa: a systematic review protocol. 2. Centers for Disease Control. “Chickenpox (Varicella): Monitoring the Impact of Varicella Vaccination,” updated 1 July 2016, accessed 29 March 2018. 3. Centers for Disease Control. “Chapter 22: Varicella,” The Pink Book. Ed. Weinbaum, Cindy. Updated 11 August 2015. Reviewed 15 November 2016, accessed 29 March 2018. 4. Gladwin M and Trattler B. Clinical Microbiology Made Ridiculously Simple, 3rd Edition. “Chapter 26: Herpesviridae.” 2004. 5. Gladwin M and Trattler B. Clinical Microbiology Made Ridiculously Simple, 3rd Edition. “Chapter 23: Orthomyxoviridae and Paramyxoviridae.” 2004. 6. Seward J, Jumaan A. VSV: persistence in the population. In: Arvin A, Campadelli-Fiume G, Mocarski E, et al., editors. Human Herpesviruses: Biology, Therapy, and Immunoprophylaxis. Cambridge: Cambridge University Press; 2007. Chapter 40. 7. Seward JF and Marin M. “Varicella Disease Burden and Varicella Vaccines.” WHO SAGE Meeting, 2 April 2014, accessed 29 March 2018. 8. Centers for Disease Control. “Chickenpox (Varicella): Prevention & Treatment” updated 1 July 2016, accessed 29 March 2018.